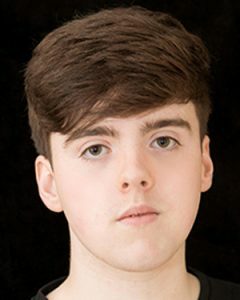 Ian O’Reilly is currently performing in Martin McDonagh’s ‘The Cripple of Inishmaan’ at the Gaiety Theatre in the role of Bartley. Ian’s first taste of the acting world came at the age of 11, in a production of “The Wizard of Oz” in which he played the Wizard. Ian is most known for his role as the quirky and upbeat Padraic O’Dwyer in the hit Sky1 sitcom, “Moone Boy” directed by Declan Lowney, Ian Fitzgibbon and Chris O Dowd. The show has won multiple awards, including an International Emmy for “Best International Comedy” and a British Comedy Award. He also played a principal character in Zoo (feature) and Mal Chess Nerd/D.J. Animal in Metal Heart Directed by Hugh O’Connor. Show Me Love Bressie Music Video Ð New Single.